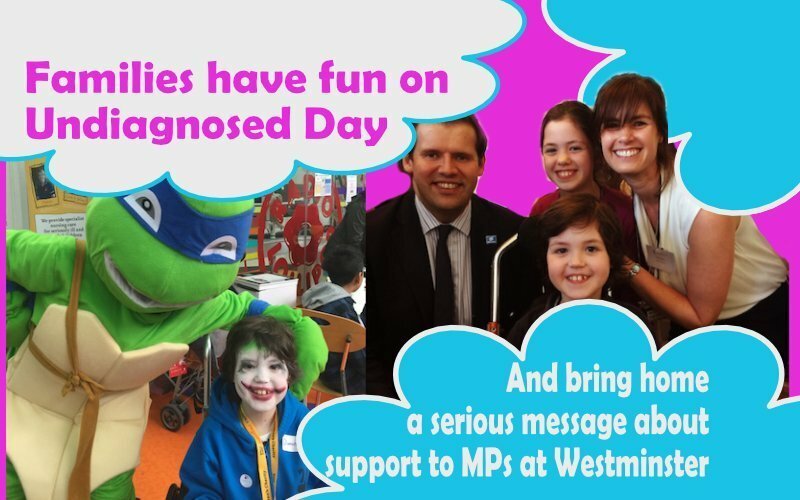 I've been to a couple of events in the last week or so around Undiagnosed Children's Day. As going anywhere is quite an effort for me, I wanted to share some lovely pictures from them. They were both pretty amazing events as far as it goes for raising awareness for hundreds, if not thousands of families whose children have rare and undiagnosed conditions. There are 7000 different rare diseases and countless undiagnosed ones so it is unlikely that you do not know of a family concerned, even if yours is not. This is why I have always felt it is important for Special Needs Jungle to shine a light in this really important area and I hope you will support me in this. The events were Birmingham Children's Hospital's Undiagnosed Day event where our columnist and one half of the SNJ EHCP Transfer Clinic, Marguerite Haye and I held an adhoc clinic. The parents we spoke to had been given incorrect information or told nothing at all by schools and LAs. In one young man's case, staff had greatly underestimated his quite obvious intelligence, to only offer him the kind of course at age 14 that "a SEND pupil" should go on, instead of allowing him the full range of GCSEs that others in his school could choose from. Does this make you angry? It certainly does me, especially as he was an extremely engaged, cognitively able and delightful young man. I hope the information we gave him and his mum will help. The second event was the launch of the first report by the All Party Parliamentary Group on Rare and Undiagnosed Diseases, that Genetic Alliance UK has strived to bring together. The report, "Undiagnosed genetic conditions and the impact of genome sequencing", highlighted family stories and the impact of living with a condition that doesn't have a name and therefore, no care pathway or medical specialists. Support is hard to come by, which is why SWAN UK was set up. One SWAN mum, Sarah Oakes, spoke about finally receiving a diagnosis for her six year old son, Joel, after a genetic match was found. You can read the story of the event in tweets, in a Storify by Rare Disease UK which, along with SWAN UK are part of Genetic Alliance UK. Here's my pics put together in a slideshow - enjoy! If you'd like to catch up with all the blogs for the day, I've added them below. If I missed yours, please add it in the comments - and yes, Ms Complicated G, I went and found yours..! How do Apprenticeships support young people with SEN?